- Each time you press , the mode switches between the daytime mode, nighttime mode and off mode. 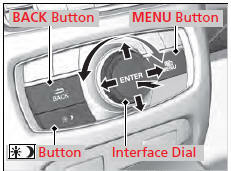 The navigation*/audio system is voice operable. Move , , or to select secondary menu. When you unlock the doors with your remote, the driver’s ID (Driver 1 or Driver 2) is detected, and the audio system settings and preset memory are turned to the respective mode automatically when you set the power mode to ON.